Broadway theatre is such a diverse medium for creativity. There is no formula for a memorable, enjoyable show. A full-on dramatic, musical spectacle like Phantom of the Opera has the ability to leave its audience astounded but so does a pared down, three-cast member comedy like An Act of God. A smile can come out of any type of play or musical as long as its done right. And An Act of God is done right. An Act of God is a one-on-one rap session with the Almighty Himself. God, played by the ever so sharp Jim Parsons (Big Bang Theory), comes down from the infinite heavens along with his archangels Gabriel and Michael to Studio 54 to get some things off his chest and to answer some of the human race’s deepest, oldest, most frequently asked questions. In this show, God is a jaded Creator and tired of our human race BS and wants to spend 90 minutes or so to make fun of us so we get the message. It’s hysterical because we totally deserve it. An Act of God is a minimalist play. There’s only three cast members, not much blocking and stage direction, and the set is pretty simple. But Jim Parson’s clever and quick quips and his expert comedic timing make the entire show. He controls the set just as powerfully as, say, God would. He is dynamic, game for anything, and totally on the ball. He will catch you off guard (maybe even take a shot at you) and leave you laughing uncontrollably in your seat. I guess, if there was a formula for a great Broadway show of any genre, it would at least include smart writing and charismatic actors to carry it out. The goal of a Broadway show, or at least one of them, is to make the audience feel that what’s happening in the theatre is real. An Act of God definitely holds up on that end. 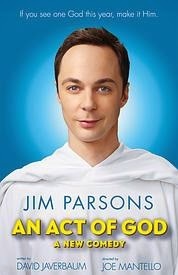 If you enjoy a wickedly clever comedy and love Jim Parsons (and honestly, who doesn’t?) then you should check out An Act of God playing at Studio 54. Here at Applause Theatre and Entertainment Services we can get you tickets for a great price and ensure that you will have a heavenly experience.